We went to see Albert Nobbs. I know that it’s receiving only lukewarm reviews, but I really enjoyed it. Glenn Close plays a repressed, reclusive little wisp of a man who is, in fact a woman. He works as a waiter in an Irish hotel in the late 19th century, painstakingly saving enough to realize his dream of one day owning a tobacconist shop, and terrified of exposure. It’s a sad little story, and for much of the film, I feared for Albert. 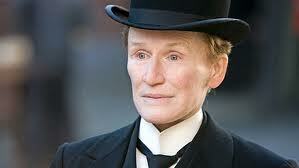 There have been criticisms that Glenn Close is wooden, but I don’t agree. It’s a very tense, coiled performance and the character of Albert is so repressed and taut that his emotions can only be portrayed as minute gradations, tightly controlled. Apparently Glenn Close first played the role off-Broadway in 1982, and she and John Banville wrote the film adaptation. It doesn’t surprise me that John Banville was involved: the film is bleak and sharp, as much of his writing is. Critics be damned! I liked it.